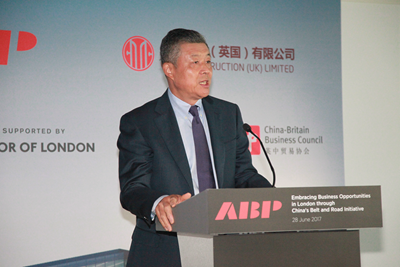 On June 28, Ambassador Liu Xiaoming attended the groundbreaking ceremony of ABP Royal Albert Dock London, and delivered a speech entitled Golden Opportunity for Win-Win Cooperation. 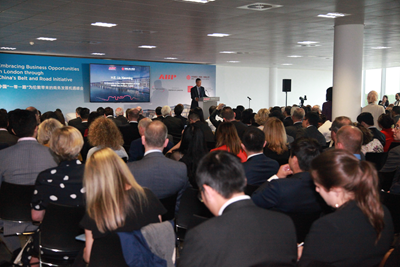 Greg Hands, Minister of State for International Trade, Sadiq Kahn, Mayor of London, Sir Robin Wales, Mayor of Newham, ABP Chairman Xu Weiping and nearly 300 people from British government, business circles and a number of diplomats in the UK attended the event. In his speech, Ambassador Liu said that the Docklands in east London was first built in the 19th century. Over the past century, it has witnessed the prosperity of maritime trade, the rise of the City of London, and the boom of China-UK cooperation. ABP, joining hands with CITIC Construction, is setting out to develop London's third business district, an urban complex of offices, homes and retail commerce. The historic Royal Albert Dock will be brimming with a new life. Ambassador Liu pointed out that the current world situation is faced with changes, increased uncertainty and instability. However, this ABP project has brought at least four things that are certain and remain unchanged, which provided China-UK relations with more certainty and stability. First, the strong momentum of China-UK relations remains unchanged. The ABP Royal Albert Dock project was one of the earliest "golden fruits" in the "Golden Era". Today, the groundbreaking of this project accentuates the steady progress of the cooperation between the two countries, and highlights the vigorous growth of bilateral relations. Second, the immense enthusiasm of Chinese businesses for investing in the UK remains unchanged. Since the Brexit Referendum, investment from China has gone up rather than down, and this project, as one of the examples, is definitely a vote of confidence for the UK's future. Third, the huge potentials of China-UK cooperation on the Belt and Road Initiative remain unchanged. 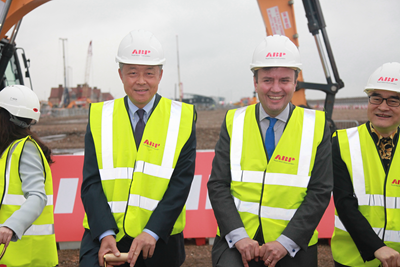 The ABP project is a key project of China-UK cooperation under the Belt and Road Initiative. Thanks to the concerted efforts, cooperation on the Belt and Road has become a new highlight of China-UK relations. Fourth, the win-win nature of China-UK cooperation remains unchanged. The total investment of the project is 1.7 billion pounds. As a new model project of China-UK win-win cooperation, this project will not only create a good number of jobs for London and deliver tangible benefits across the country, but also help improve the management level and enhance the international influence of the Chinese companies. Ambassador Liu stressed that this year marks the 45th anniversary of China-UK Ambassadorial diplomatic relations, and it is also a year for consolidating the "Golden Era" of China-UK ties. Over the past 45 years, trade and business cooperation has always been a "stabilizer" and "propeller" of bilateral relations. 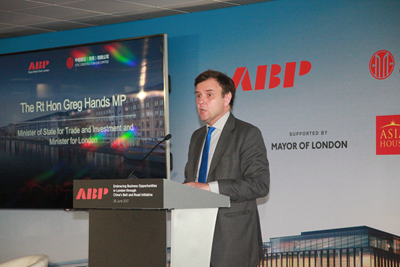 He expressed the hope that ABP and CITIC Construction would work closely with British businesses to build a high-standard and high-quality project at the Royal Albert Dock and deliver more "golden fruits" in the "Golden Era". 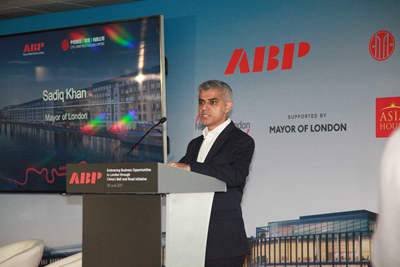 In his speech, Hands noted that the groundbreaking of ABP Royal Albert Dock London project was a vote of confidence for the UK as the UK negotiate its way out of the EU. This £1.7 billion project will strengthen the business relationship between the UK and China and between the UK and other emerging markets in Asia, and enhance London's position as a world-class business destination. This project, as an important cooperation project under the framework of the Belt and Road Initiative, is highly exemplary. Britain will continue to propel its enterprises to participate in the Initiative and contribute to more pragmatic results to UK-China economic and trade cooperation. Mayor Kahn congratulated on the groundbreaking of the project, and said that this was another major investment and development project in the Greater London that would create more jobs for London and boost the development of the East London as a whole. After Brexit Referendum, investment in London has gone up rather than down, which fully proves the confidence of foreign enterprises in London's economic development. London government will continue to work on creating an open investment and business environment to welcome more top-notch enterprises to London. 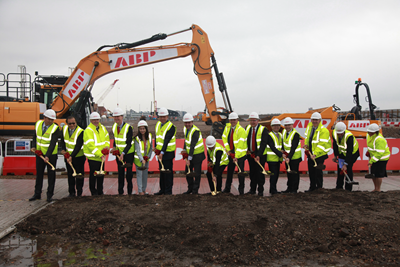 The ABP Royal Albert Dock Project Development Agreement was signed between ABP and Greater London Authority in May 2013. CITIC Construction, as one of the general contractors and shareholders, will develop this project together with ABP. And this project is designed to be carried out in three phases, with the first phase to be completed in early 2019. It covers an area of 35 acres and has a total investment of 1.7 billion pounds. After its completion, it will cover a floor-space of 4.7 m sq ft housing offices, homes, retail shops, and leisure centers, etc.